Printers are not just for offices anymore; everyone is using them for copying personal and office documents, photos, addressing envelopes, and a multitude of other tasks. The HP Pro 8610 Wireless All-In-One Color Inkjet and Printer is designed to help you make a professional impression,without spending a fortune on a laser printer. You can print from practically anywhere, and make high-quality copies with this machine. The HP Pro 8610 Printer is a hefty, well-built machine. 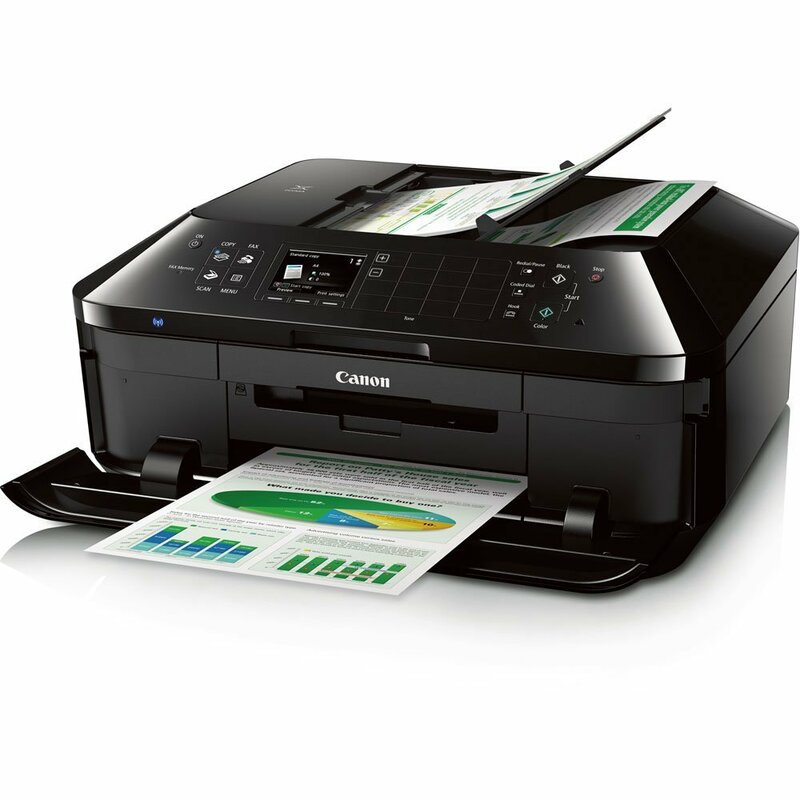 Its scanner and auto-document feeder are way beyond other inkjet printers. The lid is thick and solid, not thin and flimsy like some other models. The assist mechanism holds the lid nearly upright. Setup is easy and will take less than 30 minutes. This printer will connect to a USB, ethernet, or WIFI. It doesn’t lose its settings when you shut it off or unplug it. The touch screen is a good size and works well, displaying a sensible menu. Although it’s only 3 colors, it does a fine job on photos. The paper tray holds a full ream of paper, and it spits out copies quickly.The printing speeds are fast – up to 19 ppm for black and white, 14.5 ppm for color prints. This machine makes it easy to do various tasks and access apps – just touch the screen. It will even print from a flash drive, without using a computer. The recommended monthly output is 250-1500 pages. It’s ideal for a small business that needs eye-catching marketing materials. This printer does fine on business documents on plain white paper and photos, but the HP Pro 8610 Wireless Printer does have some drawbacks. On Paintbrush, for example, the colors are not as vivid as one would like. When scanning, you can’t set the default scanner for color scanning. You have to manually scan the document and set the scanner for color; then it only holds the setting for that specific job. When the machine is copying photos, the photo paper doesn’t pick up easily from the tray. In regular printing, the machine tends to pick up more paper than needed. Then there’s no button to cancel the printing. Envelopes are another issue. The HP Pro 8610 has no bypass for odd-sized paper or envelopes. You have to take out the paper tray, remove the paper, then position the envelope, then slide the holders to fit the envelope; then slide the tray back in, print the envelope, and repeat as needed. It’s inconvenient. There are many great printer options available, and if you would like to see some other printers before making a decision, we recomend having a look at the Canon PIXMA MG5520 or the Brother HL-L2340DW Compact Laser Printer. The HP Pro 8610 Wireless Printer is a great home or office machine. It does everything a printer should: scan, copy, print, and fax. Despite the few minor inconveniences, it’s a sturdy, hard-working, multi-tasking machine. The HP Envy 5660 Wireless All-in-One Printer is a machine the whole family can use. It prints clear documents and sharp photos, and the flatbed scanner allows you to save your document as a PDF, or scan it directly to an email. With easy setup, wireless capability, and a reasonable price, this is one of the best printers for a small office anywhere. For fast, wireless, affordable printing that’s great quality, the HP Envy 5660 Printer is a good choice. It’s easy to set up and connect to your WIFI. While some printers take you through an annoying alignment process before you can print, this one has a box pop up, giving you the option of aligning, postponing, or cancelling an alignment, so you can proceed to your job hassle-free. This HP Wireless Printer takes all sizes of paper and prints well on glossy photo paper too. The main input tray holds 125 sheets, and the photo tray holds 15. Copies can be reduced or enlarged, 25-400%. The pop-out paper tray pops out when a print job is requested. After the job is complete, just push it back in. Scanning is easy, as long as you download all the features into your computer from the included CD. You don’t have to download any drivers from the Internet. With the HP remote windows app, you can control the product remotely for scanning or other jobs. You can also scan a document as an email attachment directly from the printer’s touch screeen. The HP Envy 5660 requires only two ink cartridges – black and tri-color – and the combo pack costs about $32. It this machine runs out of one or more colors, it will still print! And it’s easy to change cartridges: just lift the lid and the glass plate, pop out the old cartridge, and snap in the new one. There are only a few small issues with the HP Envy 5660: it may be a little slow, and the colors in the photos it produces may be slightly off. The scanner lid allows only a thin document or book before it has trouble closing, and the touchscreen LCD has small letters, so it’s easy to hit the wrong ones. The quality is not as good as a high-end model. If you want to have a look at a few other great options before making a decision, check out the Brother HL-L2340DW Compact Laser Printer or the Epson Expression XP-410. The HP Envy 5660 Wireless All-in-One Printer is an ideal machine for a student, a family, or a small business. You can print from mobile devices such as smartphones, tablets, Internet-connected PCs, and more. For convenience and clear, sharp documents and photos, this one can’t be beat. If you’re looking for great printer that’s easy to set up, doesn’t cost much, but delivers sharp, clear documents, consider the Brother HL-L2340DW Compact Laser Printer with Duplex Printing and Wireless Networking. This model was designed with the small business owner or office manager in mind. It will even print from a mobile device. First of all, the Brother HL-L2340DW is easy to install, even for someone who’s not a “techie;” it can be done in a few minutes. Just install the toner cartridge; plug in the printer and turn it on; and connect the printer to your home WIFI network. It’s small, desktop- and user-friendly, and prints quickly, all for a low price. This machine connects to a single computer using a USB cable, via the high-speed USB port. It can also connect to various devices, such as Apple, Android, Kindle Fire, Blackberry, and others. A port for a USB A-male and B-male cable is included. The Brother HL-L2340DW Compact Laser Printer will print clear black and white pages, up to 2400 x 600 dpi resolution. If you’re a college student on a budget, the grayscale may be fine for you, and with double-sided printing, you can quickly get those assignments completed. In addition, there is only one toner unit to replace instead of the three or four ink cartridges with an inkjet printer. And its small size and quiet operation make it ideal for a dorm room. When you’re using the wireless connection, the machine may go into Deep Sleep mode and won’t wake up until you turn it off, then on again. This can be annoying – you have to go to the printer, wake it up, then go to the computer to command it to print – then go back to the printer to collect your documents. Setting up the Brother HL-L2340DW Compact Laser Printer be difficult if you have a Mac. You may have to switch it on and off a few times to get it to work. Another problem is that it doesn’t remember the WIFI if there’s a power outage, or for more than a few days. You may have to frequently reconfigure the WIFI. This machine prints only about 27 pages at a time, which is fine for small jobs – not so great if you have a 500-page manuscript. It takes 4 minutes to print a 5-page document, so you can’t be in too much of a hurry. If you want to see reviews of some other great printers, have a look at the Brother HL-2270DW Compact Laser Printer or the Canon PIXMA MG5520. The Brother HL-L2340DW Compact Laser Printer with Duplex Printing is great if you have a small business and a small office. It’s more than adequate for a variety of office jobs, like multi-page reports, spreadsheets, invoices, and much more. The HP C5X25 Deskjet 1513 Printer with Scanner and Copier is a great little machine with no frills or fancy features, but it completes the tasks of printing, scanning and copying. It’s easy to set up, and the pages come out clear. It’s great printer for a small office or for a student’s homework. This model is a basic printer/scanner/copier, which sets up in only minutes. You can’t beat the HP C5X25 Deskjet 1513 for price and functionality. It’s trouble-free: just turn it on, plug in the USB port, and you’re ready for business. It comes with an installation CD, or you can download the software from a website. The color printing aspect adjusts itself, so there aren’t a lot of test pages wasting paper and ink. This machine is a nice lightweight, compact printer for small jobs. It produces good copies and jams infrequently. It comes with everything you need, except paper. It’s ideal for anyone who needs a backup printer, or if you have a small office, or a young person with homework assignments. One problem with the HP C5X25 Deskjet 1513 Multifunction Color Photo Printer is that, while the machine itself is inexpensive, the ink isn’t – and it uses ink pretty fast! The scanner will work even if the printer is out of ink, but it won’t print unless both of the ink cartridges are at least half full. It comes with a small amount of ink initially, so you’ll have to buy more within a short time. Because this is an inexpensive, basic machine, there is a list of things the HP C5X25 Deskjet 1513 just won’t do. It doesn’t support wireless printing. You can’t email the device and print “from anywhere.” It will print only via a USB cord. Unless you buy a printer with an “e-print” button on console, you can’t set it up to print wirelessly from a phone or tablet. A few other negatives: there’s no printed instruction manual; the CD for the software won’t work for a Mac; it’s hard to print envelopes; and it doesn’t do faxes at all. 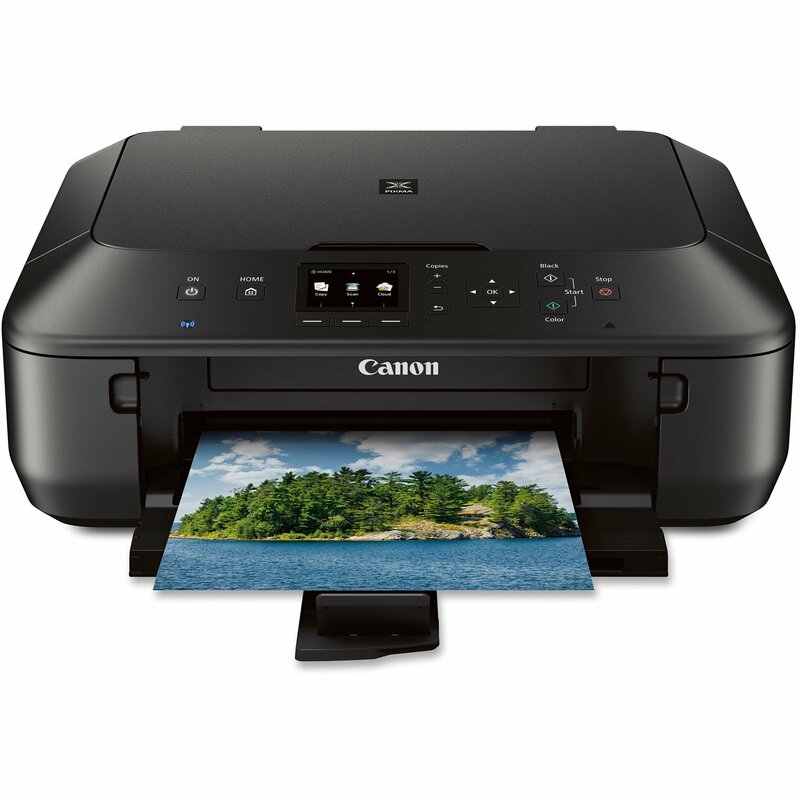 If you want to look at a few other all-in-one printers, check out our review of the Canon PIXMA MX922 Wireless Color Photo Printer with Scanner, Copier and Fax or the Canon PIXMA MG5520 Wireless All-In-One Color Photo Printer. The HP C5X25 Deskjet 1513 does what’s designed to do: print, copy, and scan. Anyon wanting more should invest in a more expensive machine. You do get what you pay for, after all. That being said, this is an ideal printer for a small office or for a student. I was looking for a small sized printer for my small business. 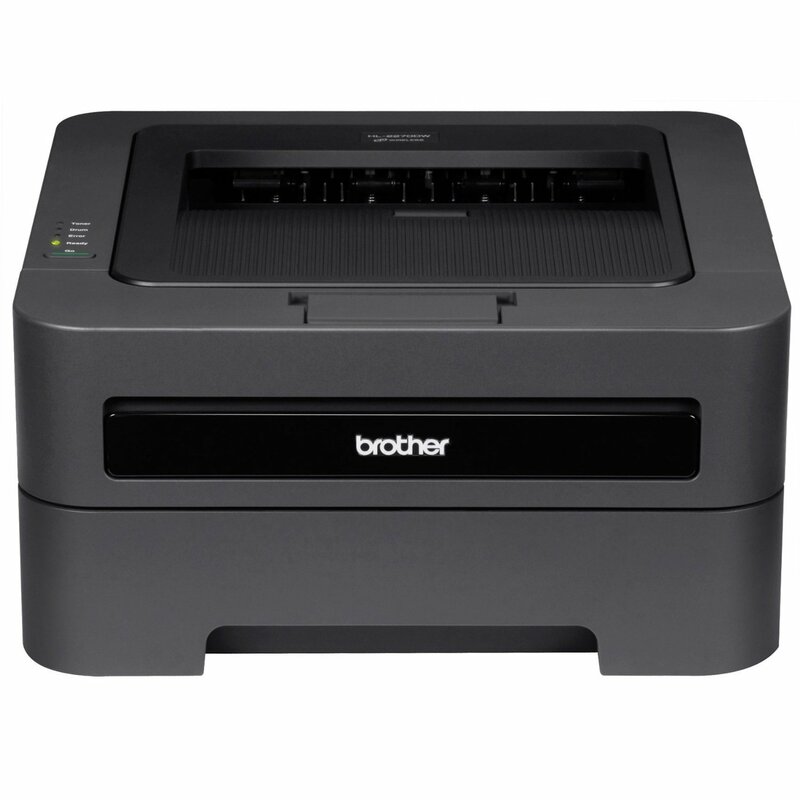 The Brother Printer DCP7065DN Monochrome Laser Multi-function Copier is a great laser printer that fills my needs with complete ease. I saw it at my friend’s house and found it quite efficient for all my business and home chores. My friend was very happy with its services and suggested that I buy it immediately. I own this printer and am using it daily, it is one of the best purchases I’ve made, and definitely one of the the best printers that I’ve used for any of my businesses. 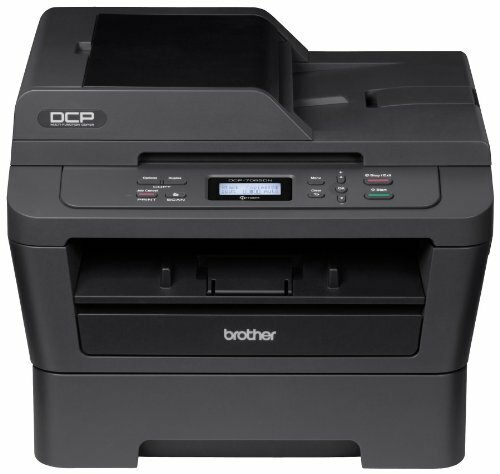 Brother DCP7065DN Monochrome Laser Printer/Copier is a multi-functional laser copier best suited for small offices. This printer offers high quality mono-chrome laser printing, copying and color scanning in one go up to 27rpm. It does not require any Personal computer and can copy on standalone basis. It is an auto document feeder with 35 pages of capacity. It can scan emails, images and various OCR files absolutely hassle free. I can copy or scan multiple documents in one go without getting aggravated. It comes equipped with the built in Ethernet network interface and facilitates sharing with many users on the network. It can connect itself with a single computer locally through USB interface. Its automatic duplex produces 2 sided outputs. Its elastic paper handling offers high convenience to me. Its tray has a capacity of 250 sheets and can be adjusted accordingly. The manual bypass slot prints thicker media. Its two 600 pages high yielding replacement toner cartridges facilitates at very less operating costs. Printing is pretty fast on the Brother Printer DCP7065DN . It hardly takes 20 sec to take out the first print out. It is quite reasonable in cost. It has an appealing look and you can buy it for merely $110. It is low in energy consumption. Its solid drivers or software are compatible with Mac. I have no idea about its compatibility with windows. It offer stress free and smooth duplex printing. You do not require any computer to copy your content. It comes equipped with super light of 25 lbs with a small footprint. Its toner cartridges are economical in cost. It has a button which when pressed stops the existing printing job. It is not like other printers that terminate the whole operation that have not even initiated. You need to be conscious while closing its flatbed scanner as its scanner lid is loaded with delicate spring. So be kind with its closing. It opens up to 45 degrees only instead of 90 degrees though I can take out all my Xerox copies easily. It does not support Linux very well. The automatic document feeding fails to scan double sides of the pages. However, you can primarily scan on one side and later on print on the other sides. I would highly recommend Brother Printer DCP7065DN Monochrome Laser Multi-function Copier to all those who want to have a printer for small business purposes within budget.